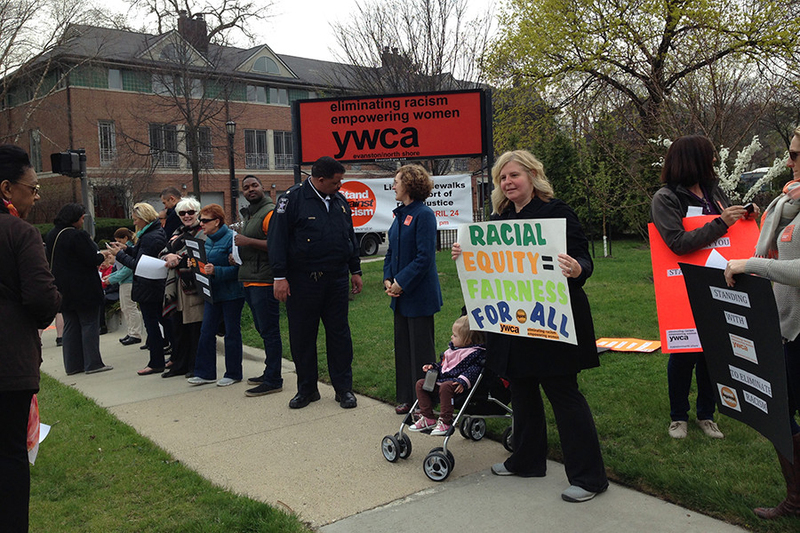 People line the sidewalks in front of the YWCA Evanston/North Shore in 2015 for the annual “Stand Against Racism.” The event drew a number of local residents, officials and organizations who pledged to work toward ending racism in Evanston. Local businesses, organizations and residents lined the streets in Evanston and Skokie on Friday for “Stand Against Racism,” an annual event organized by the Evanston/North Shore YWCA to raise awareness about racism. Hundreds of participants gathered at various locations along Ridge Avenue, Church Street and Green Bay Road to pledge to work on eliminating racism in Evanston. More than 50 groups in Evanston and Skokie participated, according to the YWCA’s website. The pledge includes a promise to be mindful of racism in one’s own life while acknowledging that “the struggle to eliminate racism will not end with a mere pledge, but requires an ongoing transformation” of people and society. At the event, participants held up signs with slogans such as “Equity = All Voices Heard” and “Black Lives Matter.” Across the country, other YWCAs have held the annual event since 2007 — though the Evanston/Northshore YMCA has only been participating since 2012. “We really started it to line Ridge (Avenue) as a public demonstration of our commitment to ending racism,” said Karen Singer, president of the Evanston/Northshore YWCA. Participation in the event has grown in the time that the local YWCA has been organizing it, Singer said. Donique McIntosh, Evanston/Northshore YWCA’s director of equity and inclusion, said a range of organizations participated. Participating organizations included community institutions such as Evanston Public Library and private companies such as First Bank and Trust. Evanston Police and Fire Departments, Evanston Township High School and local elementary schools participated as well. Various Northwestern departments and staff members also participated including the Office of Alumni Relations and Development, the Office of Institutional Diversity and Inclusion, the Women’s Center and the Office of Human Resources. Singer said participation in the event went beyond just the people who came to the designated meeting locations.